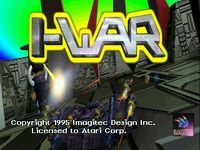 I-War (also known as Netwar) is a video game developed by Imagitec Design for the Atari Jaguar system released in 1995. The player must enter the virtual world of a worldwide computer network nicknamed "I-Way" and fight computer viruses. Source: Wikipedia, "http://en.wikipedia.org/wiki/I-War_%28Atari_Jaguar%29," available under the CC-BY-SA License.